Korean Air in Sep-2013 deployed its A380 to Atlanta, making the city the third in North America to see Korean Air's A380 service. Like fellow SkyTeam member, Air France, Korean is focussing much of its A380 attention on US points - as befits Korean Air's status as the largest Asian airline in North America, despite its population of only 50 million. But Korean Air is realising this position comes with the corollary of heavy exposure to the North American market. 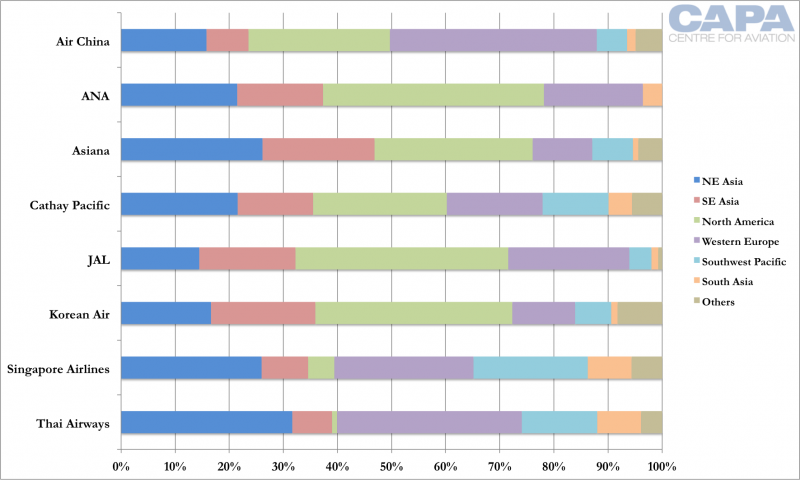 Some 36% of its ASKs are on North American routes, a single market proportion that no other Asian carrier applies. Airlines are looking to reduce risk more than ever, and Korean Air is no different: the carrier is looking for new markets it can build with time to diversify itself away from North America. Yet North America will not lose prominence anytime soon for Korean Air. 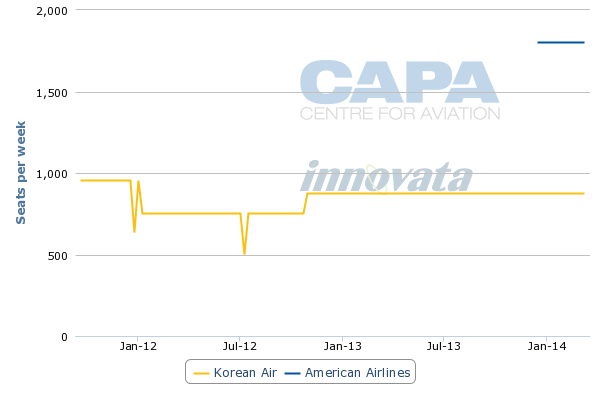 This is partially due to North America's strength but also Korean Air's weakness so far in finding new markets. It has entered Nairobi and purchased CSA Czech Airlines, both moves that will need considerable time to mature. Korean Air has broken Asian airline inertia and is thinking creatively – in some areas, at least – but now needs to bed down the strategy. Korean Air is one of a few companies that comprise the Hanjin Group conglomerate. Although Korean Air is no longer a driver of profits, it is the flagship company and the Cho family is personally interested in the aviation business; all three children of Hanjin and Korean Air chairman Yang Ho Cho are in senior posts within Korean Air. The passenger business is the focus of Korean Air, but not exclusively. In 2012 the passenger divisions (domestic and international) comprised 62.7% of Korean Air's revenue. Cargo was the next largest generator, accounting for 25.3%. Other divisions accounted for less than 5% of revenue. Profit breakdowns by unit are not given. Within the passenger division, North America is the key market. A third of passenger revenues – and one fifth of Korean Air Group's total revenue – is derived from North America. This is more than twice the size of its next largest market. North America has been Korean Air's staple source of revenue for over a decade. North America's only challenger was the domestic Korean market in the early part of the previous decade, prior to the domestic market diminishing as high-speed rail grew in Korea. North America has grown in importance from 26.9% of passenger revenue in 2003 to 32.6% in 2012. In Sep-2013 Atlanta became Korean Air's third A380 destination in North America after Los Angeles and New York JFK. Korean Air now serves three points in North America, the same as Air France (which serves Los Angeles, New York JFK and Washington Dulles). Air France and Korean Air serve the most number of North American cities with A380s. 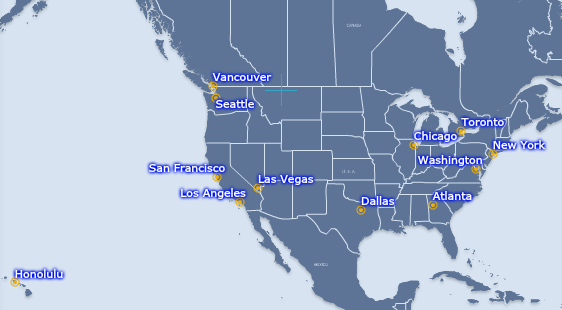 Korean Air's passenger network in North America also comprises nine other destinations: Chicago, Dallas, Honolulu, Las Vegas, San Francisco, Seattle, Toronto, Vancouver and Washington Dulles. Korean Air was able to establish a large position in the US partially due to a US-Korea open skies agreement. Favourable geography is also a factor as aircraft have been able to operate non-stop (unlike from Southeast Asia) and the shorter distances from Korea to the US compared to Taiwan or Hong Kong to the US means smaller aircraft can be efficiently used for thinner points. Additionally, transiting in Korea from other Asian points to North America is a very efficient connection. Korean Air's twelve passenger destinations in North America make it the largest Asian carrier in North America both in terms of destinations and seat capacity. Korean Air is the third overall carrier between North America and Asia after United Airlines and Delta Air Lines. This is an achievement considering Korea has a population of only 50 million. In a similar vein, Cathay Pacific's position as the third largest Asian carrier in North America comes despite Hong Kong's immediate population of seven million. Both Korean and Cathay (amongst others) see substantial transfer traffic, with Korean Air an especially large player in China-North America traffic flows. Some 36% of Korean Air's ASKs are in North America, giving it a large exposure in its single largest market. SIA's largest markets are in Northeast Asia and Western Europe, but each is only about 25% of ASKs. Korean Air's second largest market does not even comprise 20% of ASKs. Thai Airways faces similar challenges with over 30% of ASKs in each of Northeast Asia and Western Europe. 35% of Air China's ASKs are in Western Europe. Korean Air is not alone in being exposed to North America: ANA and JAL are also heavily exposed to North America, with the region comprising almost 40% of ASKs for ANA. Some carriers like SIA and Thai would like more North American exposure but are devoid of suitable geography. Indeed, North America at present is a rebounding and growing market. But with de-risking more common than ever, Korean Air wants to diversify away from North America. Korean Air may be ahead of ANA and JAL in this regard as ANA and JAL are increasing North American capacity whereas Korean Air's position on the continent is more mature. Korean Air is one of three Asian airlines with passenger service to Latin America. Its sole point is Sao Paulo, served via Los Angeles. Air China and Singapore Airlines also serve Sao Paulo – Air China via Madrid and Singapore Airlines via Barcelona. With the exception of Aeromexico, no Latin American carrier serves Asia (the closest is LAN's service to Auckland and Sydney, or Aerolineas Argentinas to Auckland). There are considerable traffic flows between Asia and Latin America, but the lack of non-stop capability means every market is a transfer option. Europe and the Middle East are core options, especially as the Middle East network carriers and Turkish Airlines are increasing their Latin American network coverage. Even Ethiopian Airlines is vying for the market as it links its quiet but notable Asian network with a new Sao Paulo and Rio de Janeiro service. Korean Air's selection of Los Angeles means that its passengers do not enjoy a seamless transfer as the US requires a visa even for transit passengers, adding burden and cost to foreign visitors. But the upside is Korean Air can tap into the local market as no carrier serves the Los Angeles-Sao Paulo market non-stop. That changes on 21-Nov-2013 when American Airlines begins non-stop service, enhancing its Brazilian network and taking advantage of LA being the largest O&D market from Sao Paulo without US carrier service. Around half of Korean Air's passengers between LA and Sao Paulo are local and not originating in Asia. Inevitably losing high-yielding O&D traffic to American Airlines will change the route's fundamental economics. While it is good to see Korean Air in Latin America, the meaning of its presence is slightly diminished given the prevalence of local traffic, meaning Korean Air has been selectively and intelligently taking advantage of short-term oversights by US carriers instead of seeking long-term markets that benefit its core Asian base. 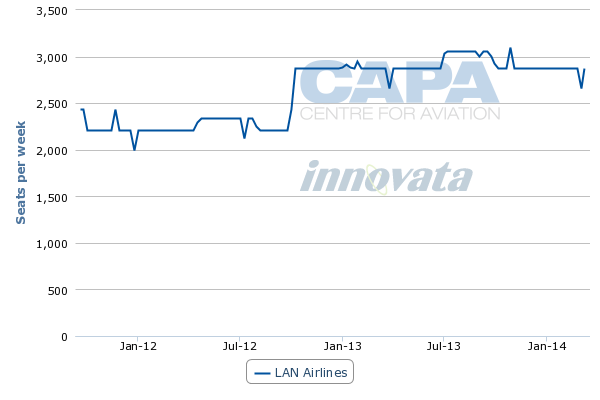 Korean Air told CAPA in Nov-2012 that it intended to open a Los Angeles-Lima service in May-2013 but this has not yet materialised and there is no update, suggesting Korean Air's strategy in Latin America is a pragmatic one and a medium-term assessment given the changing dynamics to Sao Paulo. Korean Air enjoyed the market while others were preoccupied, and it must now prove if it can be strategically competitive or was previously just in the right place at the right time. The Los Angeles-Lima market is far more competitive than Los Angeles-Sao Paulo. LAN operates a double daily service between Los Angeles and Lima. Korean Air inaugurated three A330 weekly services to Nairobi in Jun-2012. By serving the hub of fellow SkyTeam carrier Kenya Airways, Korean Air reckoned it could tap into Kenya's African network for ample connections for business and leisure purposes; Nairobi sees limited traffic as a destination from Asia. This contrasts to Cathay, SIA and Thai, which depend on strong Johannesburg-bound traffic, although they also see connections. Korean Air's approach to Africa was impressive in that Korean Air started service to a new point, wanted to work with a partner, and was relying on East Africa's geographical positioning to reduce backtracking. But the move has proven premature. Traffic is highly seasonal, and even in the best of times is highly leisure-focused with limited business traffic. The route, surely loss-making even after discounting start-up costs, has effectively subsidised many Korean and Chinese travellers' safari holidays to Kenya. Even connections on Kenya Airways may be under-performing. This contrasts to the relative success in Asia from Ethiopian Airlines and Kenya Airways, both of which are growing their networks. But their footprint in Asia has generally been targeted around Africa-Asia trading posts like Bangkok and Guangzhou. Korean Air was not helped by its Northern Asia positioning limiting Asian connections. Although Cathay, SIA and Thai serve a different African market, they are helped by having ample Asian connections. North China and Japan are the most efficient connections for Korean Air to offer. Cathay, SIA and Thai can pull traffic from those markets and more. It is early days in the Africa-Asia market and Korean Air will probably stick the market out, perhaps with some frequency changes. The growing sophistication of Kenya Airways will help the route as well. Transfer traffic – typically volatile – will likely be the focus until Nairobi – or other points – come close to rivalling Johannesburg as a business destination, although business traffic will be price sensitive more so than in other markets. Korean Air is hoping to increase its presence in Europe after buying 44% of Czech Airlines. Europe is a relatively small market for Korean Air. The carrier groups European revenue with the Middle East and CIS and this grouping accounts for about the same amount of revenue as Japan alone. But the Czech Airlines purchase offers no benefits that are immediately clear. Korean Air's Apr-2013 acquisition of a 44% stake in Czech Airlines for a light EUR2.64 million is the carrier's boldest, if unclear, move yet. It is the first time a Korean carrier has acquired a large stake in a foreign carrier. Korean Air flies to Prague with a four-weekly 777-200 service in northern winter, increasing the service to a four-weekly 747-400 offering in northern summer, catering primarily to tourists. Further capacity or frequency additions from Korean Air will likely result from the deal, complementing Czech's plans to open a service to Seoul Incheon. New flight timings are likely as Korean Air arrives into Prague at 16:50 and departs at 18:30, limiting connections from Prague to Europe while connecting passengers to Prague may face lengthy layovers. The service departs Seoul Incheon at 12:45 and arrives back at 11:15, giving Korean a wide range of connections from Seoul but more limited options inbound to Seoul. Formal management of Czech will be hands off, with Korean saying it is not interested in managing the carrier. But undoubtedly Korean's wishes for synergies as a partner and stakeholder will weigh in heavily at Czech, which will feel pressured and perhaps even that Korean is indirectly managing the airline. Korean views the deal as allowing it to gain better access to Europe by using Czech's Prague hub as a springboard for the continent, eliminating backtracking. 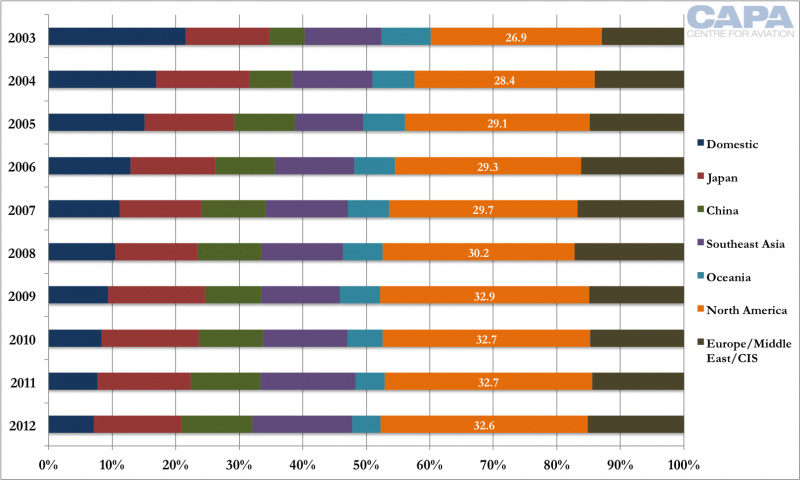 But Czech Airlines is a small player in Europe, ranking 35th on available capacity within the continent. It accounts for a fraction of 1% of total capacity. It covers a spread of main destinations (but noticeably has withdrawn from London) and seldom serves a city more than twice daily, although for Korean's connecting purposes this may be sufficient. Czech in summer 2013 is planning frequency increases and will operate to 42 destinations in 24 countries. So the two are small in their individual markets but hoping they can be stronger together. As for taking an equity stake to realise that potential, the strategy is less clear. Czech Airlines was desperate, with the country's finance minister (the Czech Republic is the largest shareholder) Miroslav Kalousek telling Reuters, "We only had two options: either find a strategic partner or consider liquidation of CSA". The Czech Government says it invited the 52 largest international carriers to bid for Czech Airlines and that Korean Air's bid was the sole offer. Korean Air holds an enviable position in China, being the second or third-largest foreign carrier. Dragonair is first while Korean Air and Asiana swap places for the second and third largest position. Yet Korean Air derives less passenger revenue from China than it does from Japan or Southeast Asia. This is partially a result of Chinese points being close to Korea but also the restrictive bilateral situation between China and Korea. Once expanded – or even upgraded to an open skies arrangement (still unlikely) – Korean Air should see tremendous growth in China. An open skies agreement between Korea and Shandong province in China saw astronomical growth, although this is a strong province for tourism, with historical ethnic links. Chinese growth will help Korean Air diversify its revenue streams. Chinese growth will also be important as Korean Air grows its long-haul network. Long-haul growth will be dependent on short-haul connections. Korea generally remains keen on an open skies agreement with China, but China understandably is concerned that the formidable Asiana and Korean Air will dominate the market. China's carriers are still young but rapidly – and impressively – learning, so the thought is to allow liberalisation only when the airlines are on a nearly equal footing. In Korea's other short-haul neighbour, Japan, there is available growth outside the slot-restricted main cities. But with the rise of Japanese LCCs, higher growth will be available to lower-cost units. The entry of Peach Aviation and AirAsia Japan into Korea has not gone unnoticed at Korean carriers. While the LCCs for now target trunk routes, inevitable expansion into secondary points will create new growth as secondary points are highly leisure based, which Korean carriers cannot sustainably serve. This is partially evidenced by Asiana's plan to serve some secondary Japanese points with a new all-economy configuration. Korean Air has a LCC subsidiary, Jin Air, that could be effective in serving Japan and later China, but so far Jin Air's growth has been restrained. Cargo in 2012 comprised a quarter of Korean Air's revenue, and this was in a bad year for freight. It is not just the passenger division Korean Air is focusing on. Owner Hanjin Group is working on a number of projects in Uzbekistan to establish the country as the logistics hub for Central Asia. This was capped with Hanjin and Korean Air using their cargo experience to open a new cargo terminal at Navoi airport. The partnership helps Uzbekistan and gives Korean Air a base for new cargo flows. It has cargo services to or from Brussels, Milan, Seoul and Vienna. In the past it has served Bangkok and Indian points, cargo routes that would not have been feasible if relying on Seoul Incheon. This was a large project for Hanjin but relatively small for Korean Air. But is still indicates Korean Air and Hanjin's entrepreneurial approach to new markets. Korean Air has made other, smaller moves to diversify itself. Korean Air has re-launched services to Saudi Arabia and converted charter services to St Petersburg into scheduled ones. Korean Air also has a cooperation MOU with Myanmar Airways International, which follows Korean Air's recent service to Yangon. While a number of Asian carriers have entered or expanded services to Myanmar, Korean Air was one of the first. Korean Air may still be very much a legacy carrier in some areas, but in others it has overcome the inertia that is too common at Asian airlines. Korean Air has made bold moves into Nairobi and with the purchase of Czech Airlines, among others. But now Korean Air needs to bed down its strategy. Perhaps some of the leaps were too bold or premature. One area the carrier has not significantly changed is alliances. It remains relatively independent and is a hard negotiator. Nor is its style very international. This is a negative factor in its new markets but also mature ones like North America, where Korean Air has an ambiguous relationship with Delta. But neither has Delta been the friendliest of suitors. Only a few years ago it dramatically tried to woo Japan Airlines into partnership as Korean's arch rival was emerging from banktuptcy. Just as the scars were healing, Delta announced it wanted a larger presence in Japan and a Japanese partner. And, seemingly embarked on a very Delta-focussed expansion, the US airline continues to grow its own capacity to Seoul, where it comes directly up against Korean. On 21-Aug-2013, announcing plans to commence a daily Seattle service to Seoul in mid 2014, Delta did not even mention its SkyTeam partner. Korean Air currently operates 5 times weekly Seattle-Seoul service with 777-200/200ER equipment according to Innovata, with not even a hint of a codeshare. The only partner Delta mentioned in its media release was its "strategic partner" Alaskan. It is a matter of when, not if, other Asian carriers will disturb the inertia and pursue new opportunities, some of which will surely conflict with Korean Air's ambitions. Much of Korean Air's success has come from moving early, but it has not always done so proficiently or reaped the full potential available to it. The question now is if Asian peers can overcome their inertia and become proficient faster than Korean Air can fine tune its strategy. Slow and steady does not always win the race in this fast growing and turbulent market.